Equipment: Retrieve object (2), broad jump, scent articles (4). Optional: Target/platform/box, distraction bowl (2). Cues: May be verbal and/or signal unless specified differently in the described exercise. 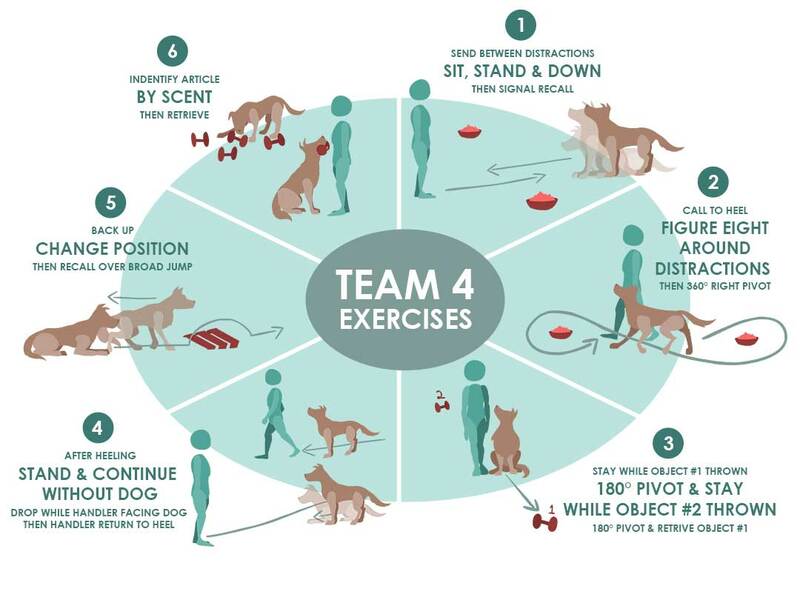 Reinforcement: Four external reinforcers (food or toy), including two distraction reinforcers, located off the handler’s body — handler may use external reinforcers to reward the dog’s behavior for up to four exercises. 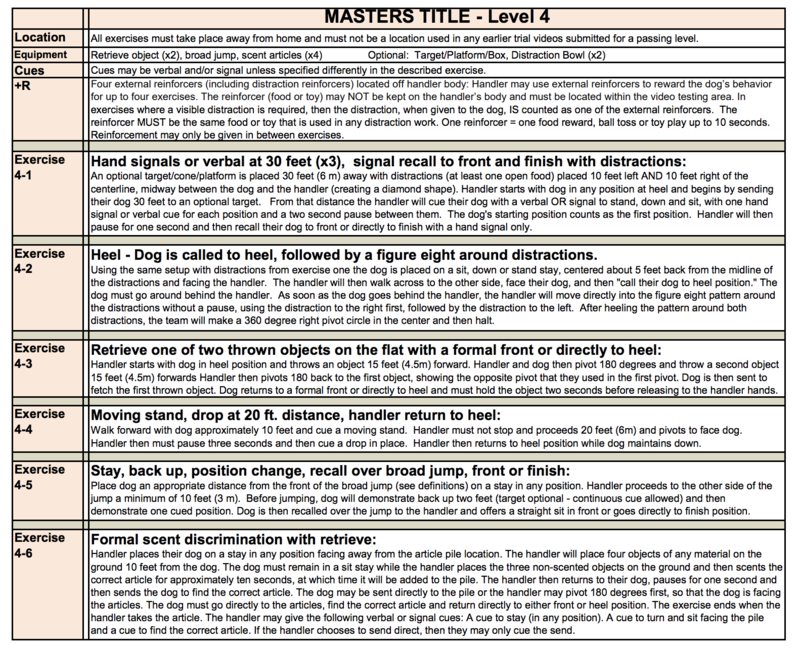 The reinforcer may NOT be kept on the handler’s body and must be located within the video testing area. In exercises where a distraction is required, then the distraction, when given to the dog, IS counted as one of the reinforcers. The reinforcer MUST be the same food or toy that is used in any distraction work. 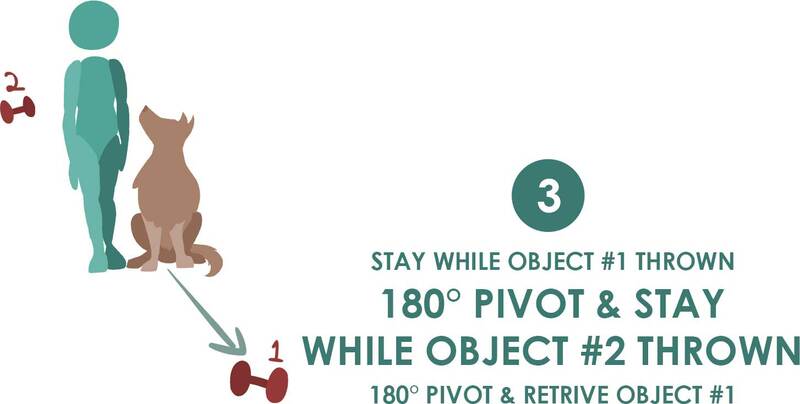 One reinforcer = one food reward OR ball toss/toy play up to 10 seconds. Reinforcement may only be given in between exercises. Hand signals or verbals at 30 ft. (x3) and signal recall with distractions. 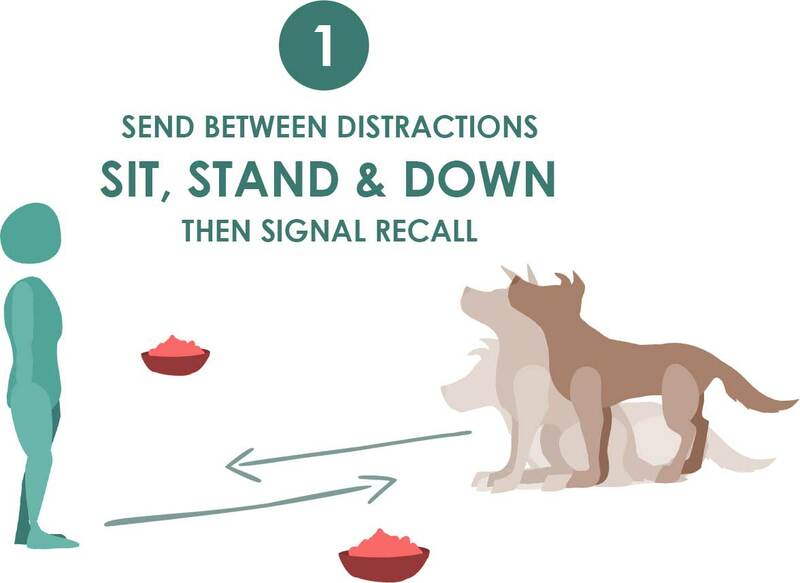 Handler sends their dog 30 ft. between distractions and then cues stand, down, and sit (in any order) followed by a signal recall. Call to heel followed by a figure 8 around distractions and 360-degree right pivot circle. 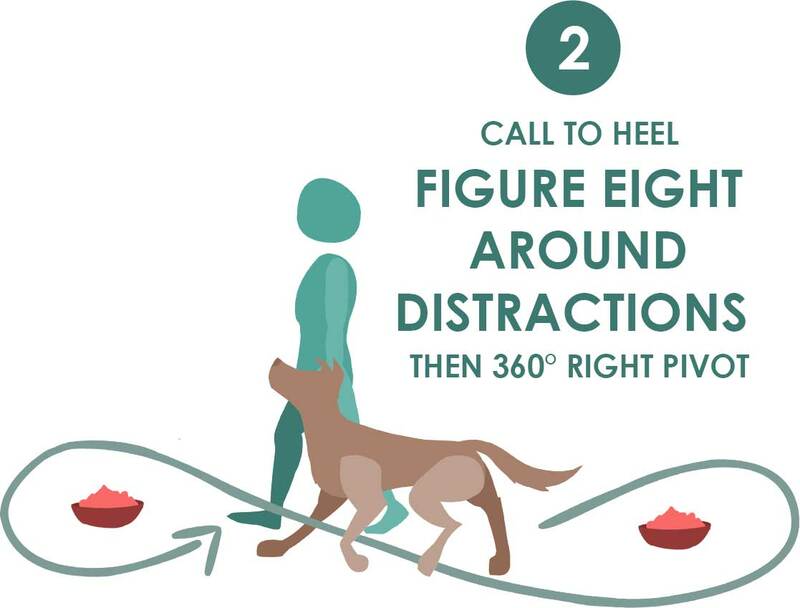 Dog will demonstrate a call to heel, followed by a figure-8 heeling pattern around distractions, and ending with a 360-degree right pivot circle and a halt. Retrieve one of two objects thrown on the ground. Handler throws an object at least 15 ft. (4.5m) forward. Handler and dog then pivot 180 degrees and handler throws a second object 15 ft. (4.5m) forward. Handler and dog do the opposite pivot 180 degrees back to face first object. Dog is then sent to fetch the object. Moving stand, drop at 20 ft. (6 m) distance, handler return to heel. Backup, change of position and recall over broad jump. 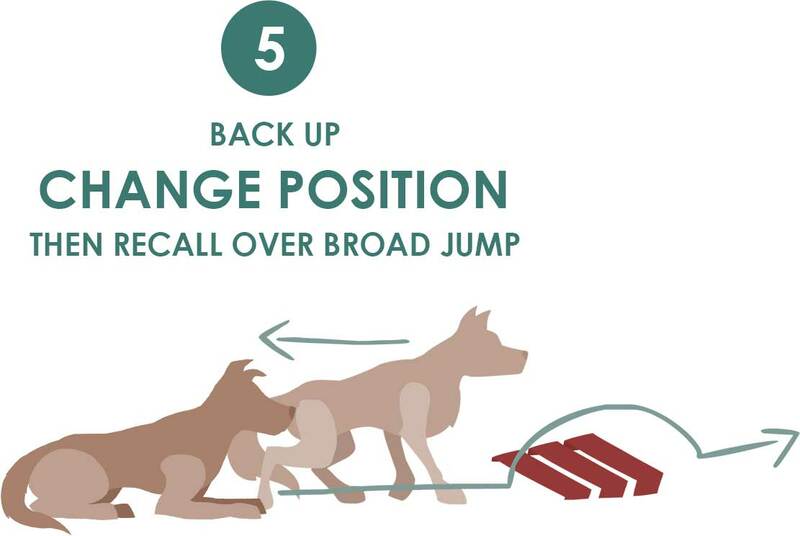 With the dog in front of a broad jump, the dog must back up and change position before being recalled over the jump and returning to handler. 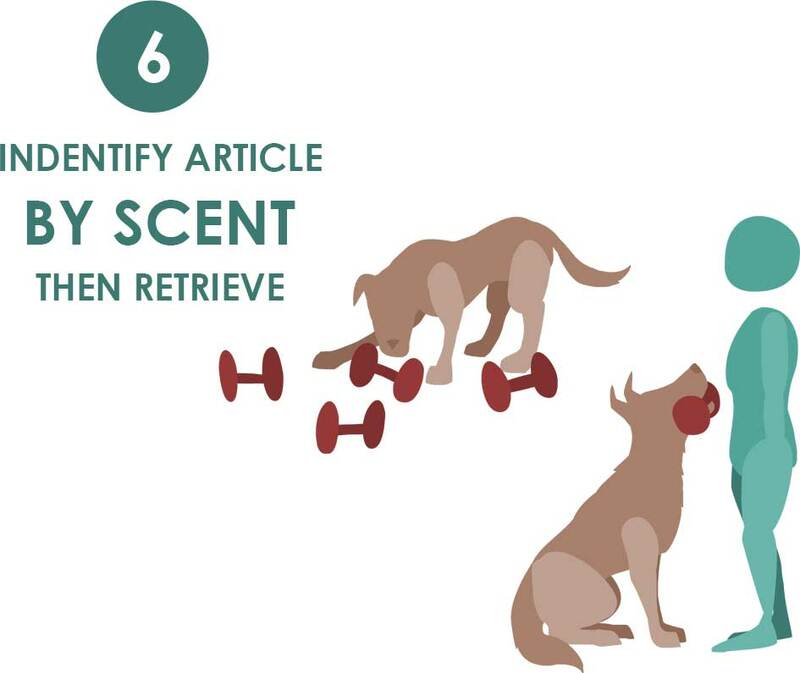 Dog must retrieve a scented article from among four choices at a distance of 10 ft. (3 m).